You can’t talk about Kieran McGonnell without mentioning color. Every painting of his is bursting with vibrancy, producing a kind of crazed energy in the work. McGonnell’s use of watercolor blending technique resembles the style of the famous stained glass art of his native Ireland. McGonnell was born in Cork, and came to the United States to study studio art and art history at Hunter College, in Manhattan. His career was enormously successful, but cut short due to complications from a tragic head injury he suffered in a fall. McGonnell died in 2011. The retrospective “Round Trip Ticket,” at Pilsen’s Ugly Step Sister Art Gallery, explores the vast array of work he assembled over his twenty-year career. 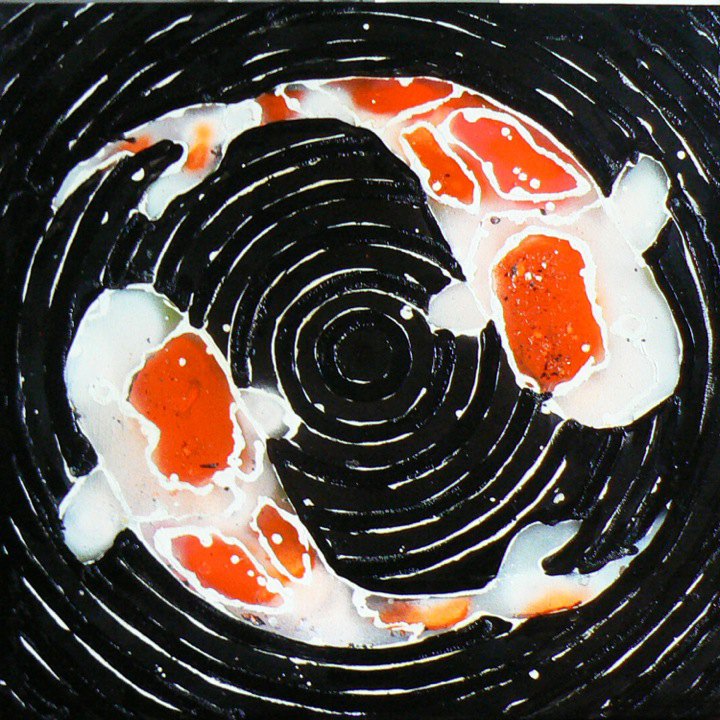 The retrospective’s title piece was rendered in oil, depicting two koi fish swimming in concentric circles. The koi, depicted in white with red splotches, contrast sharply with the black background. The circles etched into the paint suggest perpetual rotation in a stationary medium. In a statement, McGonnell said that this piece reflects his own attitude about life. The koi fish “continue to circle and orbit the earth, never to come into contact with one another. This is a life-affirming painting that reflects my spirit of optimism,” he wrote. One of the pieces most indicative of McGonnell’s Irish roots is the watercolor “Celtic Heads.” A dozen disembodied heads stare blankly at the viewer. Although they all have the same basic structure, each differs in shape and color. The watercolor “Yellow Diver” is another standout. Composed of only bright yellows and blues, the work portrays a vaguely human figure diving. The brilliance of this piece lies in its blend of colors, its mix of blue and yellow, showing the impact of the diver breaking through the water’s surface. The work has an immense sense of action for such a stationary medium; the breaking of the water is almost violent. At the gallery, a self-portrait of the artist hangs next to a portrait of his partner, Gregg Driben, in what curator Andrew Ek calls a “double portrait.” The self-portrait is abstract and warped, with layers of paint made to compose a face. The portrait of Driben, on the other hand, is near-photorealistic, creating an interesting contrast in how McGonnell viewed himself and the person closest to him. The retrospective displays not just a man’s work, but also a man’s life. “Kieran was serious, silly, very intense, animated all in one bundle and I think his work reflects that,” said Driben at the exhibition’s opening night. “His legacy isn’t up to me…but by having his art out in the world, I think it makes a connection with people. Hopefully something great will come of it.” In any event, McGonnell lives on. Isavor, cause I found just what I used to be having a look for.